The name “Tokyo RPG Factory” conjures a dreary image. An assembly line for role-playing games, perhaps, where dozens of masked workers flank a conveyor belt, smashing together parts: an oversized sword here, a Firaga there, a melancholy hero to tie it all together. Every day they must crank out a new RPG to be shipped across the globe for mass consumption. Yet the actual Tokyo RPG Factory, a small Square Enix-owned studio that was formed in 2014, takes the opposite approach. With their debut, I Am Setsuna, this small Japanese team has made something that feels unique and handcrafted. It’s a sweet, sorrowful game with a beautiful soundtrack, splendid art, and characters with real personality. It could never have been made on an assembly line. 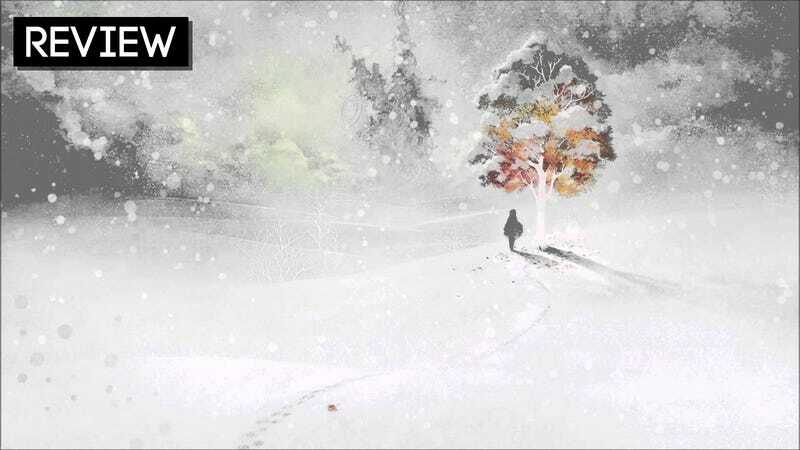 I Am Setsuna—which really should’ve just been called Setsuna—is designed to feel like a JRPG from the revered SNES era, when new classics out of Japan were an annual tradition. Like many of those older games, Setsuna is a turn-based JRPG with an angled top-down perspective. It hums a familiar tune from the outset, bouncing from serene village to monster-infested dungeon like so many RPGs we’ve played before. There’s a world map, an airship, and a never-ending stream of items to collect as you adventure from place to place. Setsuna’s biggest inspiration is the one RPG that just about everyone loves: Chrono Trigger. Director Atsushi Hashimoto has said that he and his team actually went back and meticulously played through the old Square classic, measuring map distances and combat speed so they could use those numbers as a guideline for Setsuna. Their math worked pretty well. Everything feels familiar and smooth, as if Square never stopped making 2D role-playing games at all. In fact, Setsuna’s combat system is almost identical to Chrono Trigger’s: if you run into an enemy on the battlefield, the game will seamlessly transition into combat mode, where the heroes and enemies will begin to trade off turns using the Active Time Battle system that old-school Square relied upon. There are a few new mechanics—we’ll get to those in a bit—but at its core, this is the same battle system that we played in 1995. Each character has his or her own array of skills (called “techs”) that can be combined to create more powerful attacks. Even the names are the same. Fire II! X-Strike! Delta Force! Experimenting with these combos is fun and usually necessary to take on some of the game’s trickier monsters. There are other Chrono Trigger references both big and small—including some that don’t pay off until the very end of the game—yet in some ways Setsuna feels drastically different from its time-traveling ancestor. Narratively, Setsuna has far more in common one of Square’s more modern games: Final Fantasy X. The character Setsuna, like FFX’s Yuna before her, must sacrifice herself to save the world. Surrounding herself with an entourage of noble-yet-flawed guardians, Setsuna embarks upon a pilgrimage across the globe, learning about herself and her companions along the way. It’s an adventure tinged with sorrow and mystery. Will Setsuna really have to die? Will she really have the courage to do it? Is life in this world really destined to be this miserable forever? Like Final Fantasy X, Setsuna is a gloomy game, one that digs into questions of grief, death, and purpose. I grew quite fond of the cast of characters, which includes a troubled princess-knight, a spritely yet tragic wizard boy, and a stoic swordsman who happens to be a dead ringer for Yuna’s old buddy Auron, who stole the show in FFX. Less appealing is the main character, Endir, a dull mercenary whose mute existence makes a compelling case for why silent protagonists should no longer be a thing. His dullness doesn’t make those around him any less interesting, however, and by the end of the game I found myself surprisingly attached to Setsuna and her loyal band of protectors. Everyone in Setsuna’s party is tragic, and flawed, and driven by questions that have no easy answers, which makes the story resonate that much more. One major shortcoming prevents Setsuna from reaching the heights of its revered inspirations: It’s too constrained. Whereas Chrono Trigger took you to prehistoric jungles and floating cities, Setsuna’s scope ranges from snowy mountains to… snowier mountains. There are a few snowy villages and some snowy caves, too. It’s all beautiful, no doubt, and the monotony meshes with the overall sense of melancholy in Setsuna’s icy world, but discovering surreal new locales was one of the highlights of those old RPGs. By the end of Setsuna I had gotten pretty sick of seeing the same old ruins and forests. Setsuna attempts to make up for this lack of breadth by overwhelming you with convoluted mechanics. In order to use your characters’ techs, you have to equip magical items called Spritnites. Simple enough. But when you start getting into Fluxes (random distortions that enhance your Spritnites), Momentum (a button-timed command that boosts your attacks and techs), and Singularity (random timed combat effects), it often feels like there are perhaps one too many gears whirring away behind the scenes. Meanwhile, some basic expected functions are absent, like being able to see a tech’s area of effect. Setsuna’s developers might have done well to trust that their combat system—well, Chrono Trigger’s combat system—could be appealing without so many bells and whistles. The core rhythm works well, though, and dungeons never drag on too long (with one devious exception toward the end of the game). Timed momentum attacks help make combat feel really interesting, and Setsuna’s story moves along at a rapid pace, rarely pausing as the characters learn, evolve, get sick, and try to figure out how to trust one another. The ending is particularly beautiful, tying things up in a way that’s unexpected yet inevitable. A few quirks: For some reason, Setsuna’s world has no inns. To restore your party, you have to buy a bunch of items and call it a day. There’s no way to look at the world map, even when you’re zipping around on your airship toward the end of the game. Some tech combos are extraordinarily overpowered (pro tip: use Blowbeat to quickly take out just about every enemy encounter) and some descriptions appear to be straight-up inaccurate (the Cure spell says it will heal an area, but it doesn’t). Oddball design decisions aside, I Am Setsuna is a lovely little tale and a game that’s well worth your time. At ~20 hours, it never feels dull or grindy, and in fact it felt like a perfect length for what the game wants to achieve. If Tokyo RPG Factory’s goal was to create a sad, stirring adventure that evokes memories of the past without feeling too antiquated, they nailed it, with big assists from Chrono Trigger, Final Fantasy X, and even a little Xenogears at the very end. If this is the type of story we’ll continue to get from the Tokyo RPG Factory, then hey, maybe RPG assembly lines aren’t so bad.